(Nov 12) It’s not clear why anyone would steal this bicycle. 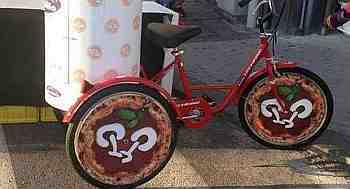 It was built by the Mario Schiano company near Naples solely for the purpose of delivering pizza. A company spokesman said, “There’s not another bike like it. Whoever took it can’t sell it, get rid of it or even ride it around. And it’s only good for delivering pizza.” But it's certainly good for that; it was built especially for Gino Sorbillo, proprietor of a well-known pizzeria in Naples and has served his pizza couriers well for quite some time. Well, someone nicked it in the night between last Saturday and Sunday. Gino searched the streets until four a.m. Sunday before calling the cops and reporting the theft. He even offered a reward—a real bicycle—to anyone who came up with it. The cops finally found it the next day in an alley in the Pallonetto di Santa Lucia area (the hill above Santa Lucia and the Egg Castle). Conclusion? It was a nasty prank. Maybe the thief didn’t like the pizza. (Nov 12) Nice parking lot. The local paper, il Mattino, ran a photo feature on Parking for the Privileged the other day, calling the situation scandalous. 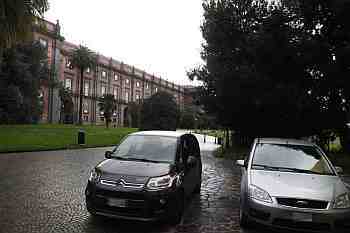 The photo shows the privileged parking at the Capodimonte Museum. All of the photos were similar; anywhere there is a nice public monument or museum, such as the entire space in front of the National Museum, those who work there are allowed to park in front or at least nearby. “Work there” doesn’t mean the janitor, either; it’s the high mucky-mucks with a few letters after their names. I mean, you don’t expect them to find a legitimate sparking space or garage and …gasp!… actually pay for it, do you?! (Nov 12) A prominent craftsman, Luigi Liverino, from Torre del Greco, has prepared this splendid manger scene, or presepe, to be presented to Pope Francis. The piece is entirely of red coral and cornelian shell (in reference to the color of corneline, a variety of the semi-precious quartz, chalcedony). Torre del Greco is the local center for highly valued ornamental work in shell and coral.Recently, two other similar manger scenes, also by Liverino, were commissioned by clients and presented to the pope's predecessor, Benedict XVI. Liverino intends to present this one personally to Pope Francis. (Nov 13) The Italian acronym ONLUS means organizzazione non lucrativa di utilità sociale (Non-profit Organization for Social Utility). It is a nation-wide umbrella designation for private organizations that promote social services. Among these is the Center for Childrens’ Health and within that group there are organizations that promote such things as music education and reading programs for children. 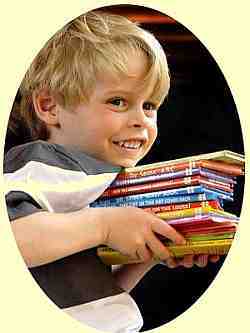 The latter is named Nati per Leggere (Born to Read). A “Born to Read” center has opened on the premises of the 18th-century Villa Cerillo in Bacoli, just up the coast from Naples. It intends to address the needs of children between the ages of six months and six years. In collaboration with the local library, the center will provide information to parents on how to choose reading material for their children and how to stimulate early enthusiasm in children for reading. eventy items from the Treasure of San Gennaro collection in the Naples Cathedral are now on display in Rome in an exhibit entitled The Treasure of Naples. This is the first time that such items have ever left Naples for exhibit elsewhere. This photo (credit: Getty images) shows one of the items on display: a necklace in gold, silver and precious stones created by Michele Dato in 1679. 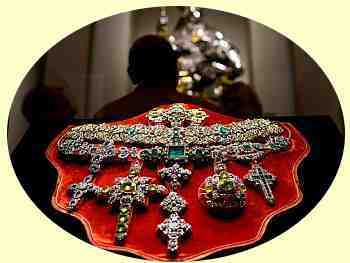 The items are considered to be some of the most precious religious art in the world. The exhibit is at the Fondazione Roma Museum in the Palazzo Sciarra on Via Marco Minghetti 22, in Rome. The exhibit runs through February 16, 2014. (Nov 16) The expressions vary from the poetic-sounding Terra dei Fuochi (Land of Fires) to the in-your-face "Triangle of Death." 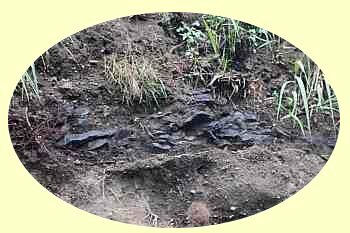 The latter is clear; the former refers to fires from burning piles of illegally dumped rubbish, often toxic. The death part refers to the high rate of cancer in the “triangle” shown in the image (right). The areas at risk extend well-beyond the lines on the map. The burning is a mob (Camorra—the Neapolitan Mafia) activity. The situation is so bad that the archbishop of Naples, Cardinal Crescenzio Sepe told an audience at an environmentalist convention recently that ''Those who pollute are not in the grace of God and may not take communion.'' It's not clear to me if this will have any effect on the perpetrators. I’d feel better if this were the Middle Ages. The Flegrean Fields are roughly the pink areas in this image. (Nov 17) The Campi Flegrei (the Flegrean Fields) have an enormous tourist potential: the Flavian amphitheater, the underwater remnants of the homeport of the Imperial Roman Western Fleet, the most recent mountain in Europe, the site of the greatest volcanic eruption in the last 40,000 years in Europe (the Campanian Ignimbrite caldera collapse), etc. etc. Yet in the area and in its largest town, Pozzuoli, you are likely to find the monuments and museums open only in a most perfunctory manner; that is, you have to rely on the good will of volunteer organizations. One such group is Culturavventura; since 2008, they have promoted kayak and canoe excursions in the fabled waters of the Bay of Pozzuoli. Yes, you can paddle where, as Virgil tells us, Misenus, master of the sea-horn—the conch-shell—made "the waves ring" with his music and challenged the sea-god Triton to musical battle. If you like to snorkel or scuba dive, you can even dive on the ruins of the ancient port! The association even has ambitions for an itinerary that will lead from Misenum to Hadrian’s Wall in Britain so you can follow the expansion of the Roman Empire. I don’t think they plan to do the whole thing in kayaks. We shall see. Other organizations besides Culturavventura include Misenum (specializing in land excursions in the Campi Flegrei); the Archaeological Group of the Campi Flegrei; the Legambiente (Environmental League); the Pozzuoli Diocese (specialzing in religious tours); etc. They do amazing work with few resources. (Nov 22) JFK in Naples. On the occasion of the 50th anniversary of the assassination of US President John Fitzgerald Kennedy, various Neapolitan newspapers today recalled JFK's visit to Naples on July 2, 1963. It was the last stop of a European tour that had included, one week earlier, the president's famous "Ich bin ein Berliner" speech in Berlin. The visit to Naples was the first time that a US president had ever visited the city and the people went crazy. (I have spoken to many who remember the visit and they are as crazy about it now as they were then.) The president landed at Capodichino airport and went by helicopter to the NATO base in Bagnoli; he arrived there at 4.39 on a fine summer afternoon, accompanied by US secretary of State Dean Rusk, Italian president Antonio Segni and Italian prime minister Giovanni Leone. He gave a short speech reaffirming US commitment to the defense of Europe. He quoted Shelly's lines that "Italy is a paradise of exiles" and said how greatly he appreciated this paradise in his own brief exile from Washington. He then returned to the airport by car, a black Lincoln convertible with the top-down. This photo (from il Mattino) is one of the classic shots of the president's car moving through the city. (The other person standing is Italian president, Segni.) 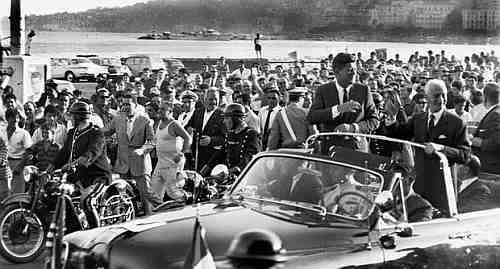 It shows the president's car moving through a dense throng of onlookers along via Caracciolo, the seaside road between Mergellina harbor and the city. In terms of security, it was a nightmare. Delirious Neapolitans crowded around the car. One man actually tried to leap into the car to hug the president. At one point, someone threw a bouquet of flowers that landed in front of the vehicle. Kennedy had the driver stop so the flowers could be retrieved and so he could wave them at the crowd. He was all smiles and so was the city. It was a fine summer afternoon. (Nov 25) The Out of Place Pianist. 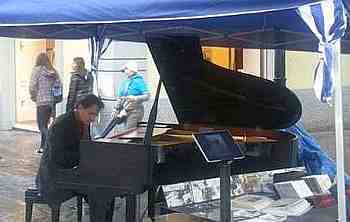 I saw the gentleman in this photo playing piano on via Scarlatti the other day. I have seen many street musicians in Naples. Some of them are not bad; some of them are even very good. This guy was great. Two things stood out: he was playing a baby grand piano and he wasn’t accepting tips. So he was more than a little bit different even from the very fine young Russian pianist I saw once playing excellent Chopin on a portable fold-up electric keyboard while his wife and daughter worked the crowd for coin. The man’s name is Paolo Zanarella. He was born in Campo San Martino near Padova, up north. He is 45 years old and has been playing piano for 35 of them. He is conservatory trained and his forte is European classical piano music, then classical-sounding piano film music, then his own compositions, and then music that he just makes up on the spot. He is a great promoter of improvisation. Zanarelli's motives in life are getting fine music out to the people on the streets, promoting music among young people, and sponsoring youth choirs. He is a national treasure and is known as "the out of place pianist" because he plays any and everywhere he can, from small mountain towns, to a barge floating down the Grand Canal in Venice, all, he says, "...so people who might not otherwise have a chance to go to a concert can hear and learn to love this music." He's an eccentric. We need more of them. (Nov 27) THE EX-NATO BASE IN BAGNOLI. (Earlier miscellaneous items on the base are here and here.) 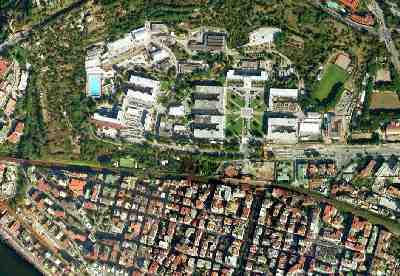 The ex-NATO headquarters is the 40-hectare (100-acre) green patch at the top of this photo. 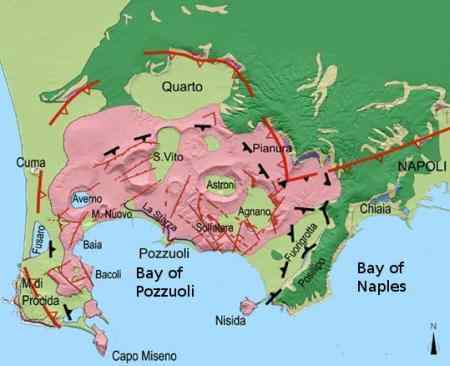 It is about 1 km from the Bagnoli coast line, (visible in the lower left-hand corner). As I note at the second of the two links (above), when the base moved some distance to the north recently, there were two possibilities for the disposition of the old base: one was "...to return the space in Bagnoli to about what it used to be when it started out in 1940...a 'Young People's College' [that]...a giant youth facility including schools, sports facilities, leisure activities, etc." Another plan was to use the premises for Naples administration office space shifted from the downtown area, thus freeing up some of those spaces in the city. This morning's il Mattino reports that the first plan, the Youth Center, seems to have been selected and that it is now a matter of ironing out the details between the Bank of Naples (owners of the property) and the city council. The city is sponsoring a get-acquainted event this coming Sunday with music and guided tours for the general population within this once verboten citadel; it is part of a plan to let the locals know what is at stake. It is considerable. When the military moved, they left pretty much everything intact: ample office space, meeting rooms, restaurants, shops, a large swimming pool, a church, an athletic track, tennis courts, and a lot of parking space. There are still two functioning facilities on the base, both of them schools: the International School of Naples and the Montessori School, both offering elementary-though-high school curricula in two languages, Italian and English. The potential is great, for if these premises can be integrated into the community, it could "restart Bagnoli." Il Mattino warns, however, that "we have heard this before." That's what they said about the even larger tract of land that used to house the Italsider steel mill about a mile from NATO in Bagnoli. Whatever those plans were, they took a staggering hit earlier this year when the mob burned part of it to the ground. The good news with the ex-Nato base is (1) that it comes almost ready for use; (2) it is a totally "gated" (and barbed-wired) community, thus relatively safe (if you beef it up with about 100 Dobermans); (3) it even has helo-pad if you want to chopper your kids to school). (Nov 28) The tradition of the 'Wishing Tree' is dealt with in detail elsewhere in these pages. 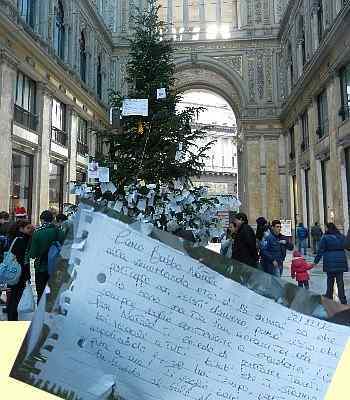 Briefly, Antonio Barbaro, a local businessman, puts up a large Christmas tree every year in the Galleria Umberto, across from the San Carlo Theater, and passers-by scribble their wishes, sentiments, declarations of love, desire for world peace, etc. on slips of paper and impale them on the branches of the tree. They are fascinating to read. At the end of the holiday season, the scraps of paper are printed in book form and sold, the profits going to charity. It is, by now, a hallowed tradition. (This blending of the northern tradition of the Christmas tree and the southern tradition of votive slips of papers is a good example of syncretism...I mean, just so you don't feel that you're totally wasting your time reading this.) Almost as time-honored, however, is the tradition that kids from the nearby Spanish Quarter, a rough section of town, shall steal the tree. This is usually followed by Keystone Kops antics to find and retrieve the tree, and then also followed by expressions of outrage from concerned citizens (most of whom recommend three remedies: German Shepherds, Dobermans, and Neapolitan Mastiffs), and then followed by whiney sociological drivel about how the poor underclass street kids are driven by poverty to theft (overlooking the fact that said impoverished urchins all now have iPhone 12s and organize the theft by flashmob). This year, Mr Barbaro put the tree up waaay too early. There wasn't a single scrap of paper when the kids nabbed it in the middle of last night and dragged it into the Spanish Quarter. They paraded past the video surveillance cameras, shielding their faces. One even showed his middle finger to the camera (a good old gesture from the USofA—talk about syncretism!) and made off with the gigantic piece of happy lumber (from up near Normandy, so I read). The coppers got it back in record time and took it back to the Galleria, tailed by Oliver Twist wannabees who taunted the cops with shouts of, "We're going to get this back, you know! Why not just leave it here?" Mr. Barbaro has a solution—he says he's going to start putting up two trees, one for the passers-by and one for the thieves. "Pope Francis, known for slipping out of the Vatican to feed the poor, was seen in a 3-wheel, green lizard in front of Naples’ very own Galleria Umberto. His friend, Archbishop Konrad Krajewski, was searching for a broomstick in the cab to put in front of back wheels to keep the lizard from rolling away. 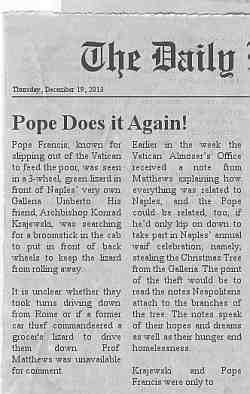 "It is unclear whether they took turns driving down from Rome or if a former car thief commandeered a grocer's lizard to drive them down. Prof. Matthews was unavailable for comment. 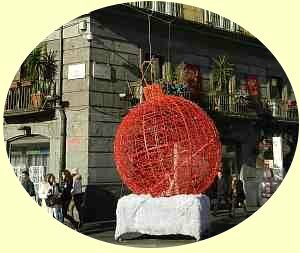 "Earlier in the week the Vatican Almoser’s Office received a note from Matthews explaining how everything was related to Naples, and the Pope could be related, too, if he’d only kip on down to take part in Naples’ annual waif celebration; namely, stealing the Christmas Tree from the Galleria. The point of the theft would be to read the notes Neapolitans attach to the branches of the tree. The notes speak of their hopes and dreams as well as their hunger and homelessness. "Krajewski and Pope Francis were only too happy to drop everything at the Vatican in order to prove everything else is related to Naples. 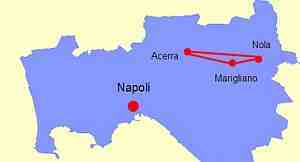 They are expected to stay an extra day in order to collect enough money for a train ticket back to Rome." ed.note: The Green Lizard (also known as the Green Ape [bee] from the original Italian) is a very popular vegetable transport vehicle originally manufactured for very popular vegetables in 1948 by the Piaggio corporation of Pontedera, Italy. The Papal “Lizzie” may be white. 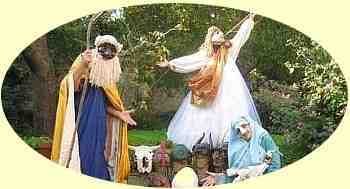 (Dec 22) The Presepe & Pulcinella. Neapolitan craftsmen are currently putting the finishing touches on a gigantic manger scene, a Neapolitan presepe, in St. Peter’s square in Rome. Pope Francis, of course, has been sending down snacks and beverages for the workers! Meanwhile, back in Naples, two interesting bits of cultural blending mark the Christmas season—two presentations of the presepe that show the traditional Nativity figures of the Holy Family in the guise of the famous Neapolitan mask, Pulcinella. One is called “Pulcinella scende dalle Stelle” (A pun on the title of the best-known Italian Christmas carol, Tu scendi dalle Stelle. See this link for more on that carol.) It is the idea of Michele Del Gross, director of a local theater company with a particular interest in the history of the presepe. The second is “Quanno nascette Pulecenella” (again a pun on a Neapolitan carol, Quanno Nascette Ninno [When the Child was born], inserting the name Pulcinella for Child in the text; Pulecenella is dialect spelling). 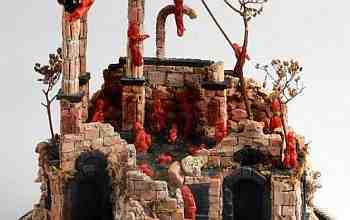 It is presented by Bruno Leone, the latest in a long line of puppeteers who have dedicated themselves to preserving Neapolitan lore. Putting a Pulcinella mask on Joseph and Mary and presenting the unborn Christ child in the form of an egg waiting to hatch may seem frivolous, even sacrilegious. Of course, it is neither. It's just what people do in order to personalize—get a little closer—to the mystery. (Dec 23) The city has decided that Piazza Plebiscito, the large square bounded on the east by the Royal Palace and on the west by the large church of San Francesco di Paola (in photo, right) cannot take too much more crowd-stress; that is, even small damage unintentionally inflicted by tens of thousands of persons crowding into this largest open space in Naples for holiday festivities. At this time of the year, such festivities have traditionally included some sort of a Christmas concert, large scale installation art set up in the square, and, of course, on New Year's Eve, a full-scale celebration with music and fireworks. The square will not be dark or closed, but there will be nothing officially loud, large and inviting to tempt those who are attracted to such things. There are other things going on in the city on a smaller and interesting scale (such as those mentioned in the item directly above this one). 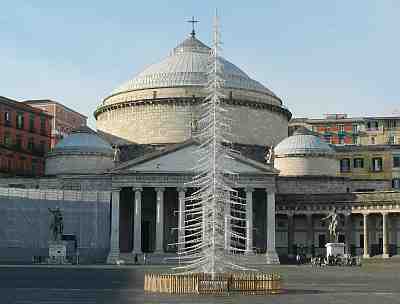 A large tree has been set up in Piazza Plebiscito; it is artificial, metallic and looks nice when illuminated at night. Also, a few large globe ornaments (photo, above left) are mounted in the square and nearby. They are globes you would hang on the branches of a tree if the tree were a thousand feet high. They are illuminated at night and also look pretty nice. It's all very low-key, and maybe that's not such a bad idea. Cardinal: You Holiness, please come to Naples. If you don't, they are going to stand me up in Piazza Plebiscito and shoot me! Pope: OK. I'll be there. We don't want another martyr. (Dec 26) The new Mediterranean Museum for Music, Art and Traditions has been opened. (Dec 29) The hard-hearted folks at city hall have had some time to think things over. They have declared that Piazza Plebiscito will not be a wet blanket (see Dec. 23, above) on New Year's amongst large city squares in Italy! Nay, we will have fireworks and 2014 (get it?) "flying lights" over the square and all along the seafront on via Caracciolo. No one--least of all, me--knows what "flying lights" are or how they might differ from your standard fireworks. I'd like to think that 2014 inefficient and pompous politicos are going to immolate themselves in gas-bags over the city, but that is probably not going to happen. This is the end of Miscellany page 43.